As of now, we haven't made a final decision on whether or not we will be moving. I am hoping things will work out that we won't have to move because the to-do list of re-locating is incredibly overwhelming, and the adjustment process is stressful on the entire family. But, if we do end up moving, I will be using some of the tips/advice given in this book to unpack my "survival box." To be more clear, the "survival box" is a list of suggestions given at the end of a chapter that can help you alleviate loneliness, express your love for your husband, be more organized, help your children through the adjustment process, and put your focus in the right place... just to name a few. It's really hard to pinpoint the most helpful tip I learned from this book, because there are so many; but I love the Scripture references that are included, and the encouraging tone of the book. I like how the author stresses the point on page 39, "A life change like moving is not easy. But God doesn't always want to make it easy for us, for it's in those stressful times that we grow closer to Him. Sometimes God allows us to go through an experience for the powerful lessons we could learn no other way." 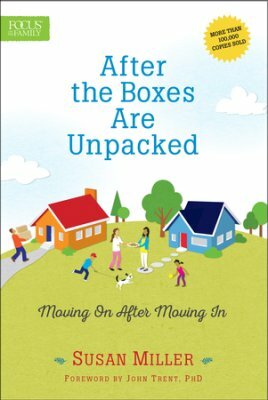 So, for those of you who have recently moved, or are planning on moving soon, this would be a good book for you to get. The advice the author gives is given out of her own experiences of moving, and it can help lead you in the step by step process of (1) letting go, (2) starting over, and (3) moving forward. Tyndale House Publishers has provided me with a complimentary copy of this book, and I have expressed my own opinion. It is so good to have trust in the Lord.